Myths and fairy tales are so much more than stories: they’re living principles, deeply enmeshed in our lives and the life of this beautiful, animate Earth. And in the uncertain times we live in, we need their wild wisdom more than ever. They illuminate who we are, who we might become, and help us discover the unique gift that each of us brings to the unceasing becoming of the world. During this workshop, we’ll explore the many ways in which myth and fairy tales can inform our journeys through life. We’ll delve deeply into beautiful old stories, come to understand the mythic patterns which underpin our lives, and learn how to work with the archetypal characters, places, and situations which influence the choices we make. Sharon will act as your guide through the enchanted forest of your imagination, offering dreamwork, expressive art exercises, and writing meditations to help you develop and deepen your own mythic imagination. Please Note: This workshop is for women only. 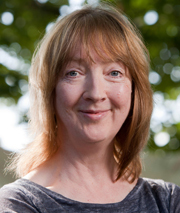 Dr. Sharon Blackie is an award-winning writer of fiction and nonfiction, a mythologist with a focus on Celtic Studies, and a psychologist who has specialized both in neuroscience and narrative. Her unique approach to working with myth, fairy tales, and folklore highlights the insights these traditions can offer us into authentic and meaningful ways of being which are founded on a deep sense of belonging to place; a rootedness in the land we inhabit. She is the author of the word-of-mouth nonfiction bestseller, If Women Rose Rooted: the Journey to Authenticity and Belonging, winner of the 2016 Nautilus Book Award. Her other books include The Enchanted Life: Unlocking the Magic of the Everyday, and the critically acclaimed novel The Long Delirious Burning Blue. 600.00 Total Fees by Room Choice.